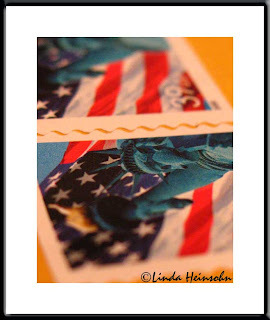 What caught my eye was the contrast between the stamp colors and the envelope background. Plus, I liked the form of the wavy flag stripe continuing across the wavy stamp edge to the second stamp. The shot is a little too 50/50 but it's basically my attempt to see how close the G6 can focus on Super Macro. Also to see how much depth of field I can get hand holding in decent light. Not much. But the LCD gives an accurate read-out on depth of field so I was able to shoot, recompose, shoot again until I got the focus just exactly where I wanted it.